Looking across tech trends in the last 100 years, the country is currently in its third stretch, said Eric Bielke, director of GE Ventures Bio. 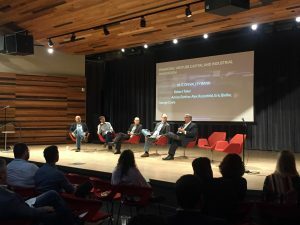 He was among a handful of venture capitalists who made up a panel at the Frontier conference on Thursday in New Orleans, an event with the goal of re-thinking the future of the industrials and energy sectors. The first technology wave was the industrial revolution, and the second was the invention of the Internet. “Now, we’re entering the third wave, and that third wave is the industrial revolution 2.0,” Bielke said. Automation is becoming more and more mainstream. Sensors are communicating with other sensors, ushering in more automated communication. Alex Rozenfeld, managing partner at Climate Impact Capital LLC, agreed that capital is being deployed to these emerging IT trends. “The best thing to do is just run a great company,” Bielke said. Adrian Fortino, partner at Mercury Fund, added that growth with scale is what investors are interested in. Rozenfeld recommended that startups have milestone plans and the entrepreneur should be able to prove and disprove inquiries about the product. “Looking long-term is extremely important,” Rozenfeld said. These decisions should be made around investment cycles, Rozenfeld said. Fortino said they are looking for startups that not only have a specified market but offer extensibility. George Coyle, managing partner at Energy Innovation Capital, added that a venture is fundable when it understands the market but also knows how to tackle other markets. No Replies to "Frontier conference explores growth in next phase of industrial revolution"